To successfully accomplish its task of managing and protecting the airspace of the Fatherland, the Air Defence – Air Force’s Party Committee and the Command of the Service have synchronously carried out a series of solutions; of which the implementation of the Politburo's Directive 05-CT/TW (12th tenure) on "studying and following Ho Chi Minh's ideology, ethics and style" is the most important one. Being accurately aware of the position and meaning of Directive, the Service’s Party Committee identified: good implementation of the Directive is an important basis for improving the quality of cadres and party members, overcoming the signs of degradation in political ideology, ethics, and lifestyle; renewing the leadership style; building clean and strong party committee and organizations at all levels; promoting the nature of Uncle Ho soldiers – Air Defence-Air force soldiers in the new era, making contribution to the management and firm protection of the country’s airspace in all situations. In order to synchronously implement the Directive among departments and units, the Service’s Party Committee issued the Plan 235-KH/ĐU, dated October 11, 2016 on promoting the studying and following Ho Chi Minh's ideology, ethics, and style in association with the implementation of the program and action plan to deploy resolutions of the Party congresses at all levels (2015-2020 term). At the same time, it has order junior levels to closely attach the planning with the implementation, the functions, characteristics, and conditions of their units; making a significant transformation in their studying and following. The party cells make annual plans and the Service’s Party Committee makes both annual and 5-year plans. The Service’s Party committees formed a staff team (the Political agency is the standing body) to lead, direct, and supervise the implementation of the plan. For its junior party committees, the person in charge is the chief of political department or the party cell’s secretary. Therefore, the implementation of the Directive 05-CT/TW has always ensured unification and consistency; promoting pioneering and exemplary role of cadres and party members, especially the political chiefs of relevant departments and units; creating motive force and competitive atmosphere in departments and units. Upholding an active and positive spirit, the Service’s Party Committee and the Military Command have focused on leading and directing the implementation of the Directive 05 CT/TW in accordance with the directions and guidelines of the Ministry of National Defence and the specific characteristics, functions and tasks of the Service. First of all, the Service’s Party Committee ordered its departments and units to launch a deep and comprehensive movement on studying and following Ho Chi Minh's ideology, ethics, and style; ensuring that all cadres, party members and the masses thoroughly aware the importance of the Directive in the creation of combined strength for consolidating clean and strong party committees, and revolutionary, regular, elite, modern Service to successfully fulfill all its assigned tasks. In accordance with their conditions, functions, and missions, Party committees and commanders at all levels have built their own lesson plans with appropriate contents and flexibly applied forms and methods of instructions so that the implementation of the Directive becomes a self-consciousness and regular activity of all units and individuals. To make it more attractive and effective, the units have applied different forms of propaganda, such as the competition on telling stories of President Ho Chi Minh, seminar and discussion about his ideology, ethics, style, etc. As a result, all cadres, party members and the masses in the Service have a deep awareness of the fundamental contents and values of Ho Chi Minh's ideology, ethics, and, style and the heroic tradition of the Air Defence-Air Force, considering these the basis for each officer and soldier to "self-examine" and "self-adjust" their daily behaviors and activities. Strictly following the guidelines: the senior level first and later the junior level; implementing the "following" with concrete and practical actions; combining "building" with "countering", the Service’s Party Committee requires the promotion of exemplary role of cadres and party members, first and foremost the leading cadres at all levels. On the basis of general ethical standards, the Service’s Party Committee instructs its agencies and units to select practical issues to include in the studying contents and conduct them with specific and feasible criteria. Annually, each individual makes his/her own plan to strive, then the party cell supplements and improves. The Party Committees and Party Cells conduct examination and supervision of their Party members on their observance of the registered contents; considering the outcome of studying and following Ho Chi Minh’s ideology, ethics and styles one criteria for judging their emulation. Thanks to practical and relevant measures, the sense of responsibility in the implementation of ethical standards, lifestyles and the mission accomplishment of cadres and party members in accordance with Ho Chi Minh’s ideology, ethics, and style have made positive changes, creating a vigorous and persuasive spread for the masses to strive and follow. In the implementation of the Directive 05, the Service’s Party Committee has attached special importance to closely linking it with the Central Resolution No.4 (12th tenure) on Party’s building and rectification. The Service’s Party Committee has instructed its departments and units at all levels to focus on building clean and strong party organizations, constantly improving their leadership capacity and combat strength, strictly observing the Party's principles, positively renovating the process of issuing resolutions and implementing them in accordance with Ho Chi Minh’s style. In meetings, the party committees and organizations have strictly adhered to the principles of democratic centralism, collective leadership, and individual implementation, promoting the spirit of criticism and self-criticism, and bringing into play the collective intellectuals in leading and implementing resolutions. The task of party-membered management has been strictly implemented. The party committees have attached the management of the party committees and party cells with self-training and self-following of each cadre and party member; resolutely fighting against manifestations of “self-evolution” and “self-transformation” from within; strictly conducting the evaluation of the studying and following of each Party members; identifying the focal contents in the following month. For the leaders, it is a requirement that they have to clarify their responsibility in the implementation and show their exemplary role in studying and following Ho Chi Minh’s ideology, ethics and style. Therefore, all guidelines have been strictly, timely, and effectively carried out; overcoming the problems of undetailed leadership or overlapping the work of the commander and the manifestations of arbitrary and executive privilege in executing, organizing and implementing. 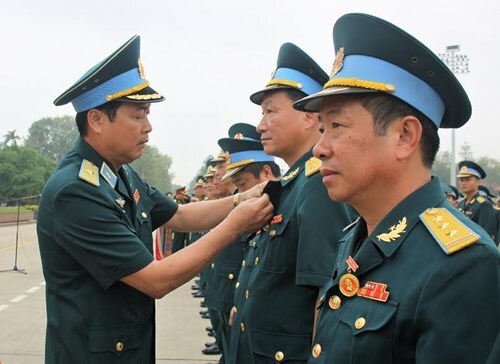 The Service’s Party Committee requires the junior party committees and commanders at all levels to regularly praise the typical examples of “good people, good actions”, replication of exemplariness. These practical activities have made contribution to the creation of favorable conditions for cadres and soldiers to strive and train themselves, promote their responsibility and self-reliant spirits, and help them to overcome difficulties.To bring the Directive 05 CT/TW into the daily life of the cadres and soldiers, the Service’s Party Committee orders its subordinates to closely link the Directive with the Movement of “promoting tradition, devoting talents, and deserving Uncle Ho’s soldiers and typical Air Defence-Air Force soldiers”. At the same time, the movements, such as the Emulation movement and many others have been implemented in depth and recorded practical outcomes, making contribution to the organizational and personnel consolidation and the task fulfillment. Among these movements, the typical ones included: “Young sentry posts”, “Youth Union with no discipline violation”, “good training, strict discipline, and typical lifestyle”, etc. With the utmost efforts of party committees and commanders at all levels, the studying and following Ho Chi Minh’s ideology, ethics, and style has gradually become a regular activity of cadres, party members, and the mass, creating practical outcomes, becoming a firmly spiritual foundation of the Air Defence-Air Force troops, and making contribution to the consolidation of politically, ethically, and organizationally strong Service’s Party Committee, building “revolutionary, regular, seasoned, and gradually modern” Service, meeting the demands of Homeland protection in the new situation.